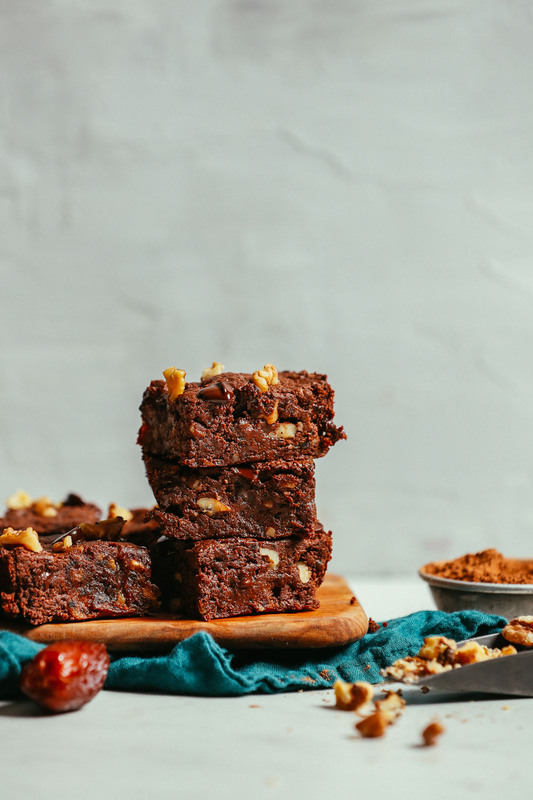 For a while now, I’ve been wanting to make a brownie that is so easy that it can be made quickly, with minimal equipment, and with ingredients I always have on hand. I imagined the texture and flavor I wanted and worked backward from there. And friends, I can’t tell you how happy I am with the results! 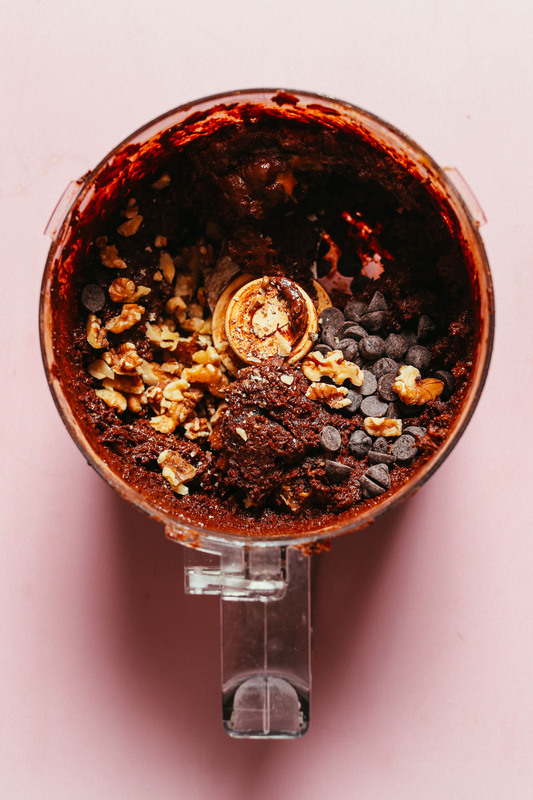 Let’s make ooey-gooey vegan brownies! The base of this 4-ingredient, 30-minute, 1-bowl recipe is dates, which create the fudgy texture, naturally sweeten the brownies, and bind the batter as well. Next comes nut butter. It’s less important which nut butter you use and more important how fresh and creamy it is. When you use peanut butter made with just peanuts and salt, you get a luxurious, creamy texture and it literally pours out of the jar. This is what you’re going for! If you’re peanut-free, I think almond, cashew, or even sesame butter (tahini) would work well here. After nut butter comes raw cacao powder for rich, chocolate flavor. Next is a little oil to thin the batter and make the brownies even more fudgy. If you’re oil-free, you could try subbing something like more nut or seed butter, or applesauce. Once mixed, you can add optional ingredients like dairy-free chocolate chips and raw walnuts! I highly recommend an addition of some kind for texture and added sweetness. After a short bake in the oven, these little gems are ready! Let cool briefly, slice, and dig in. The amazing thing is they’re delicious warm, room temperature, and cold. So store them at home or take them along with you throughout the day when you need a sweet, energizing snack. These would make the perfect treat to have on hand when sweet cravings strike. They would also be delicious to share at gatherings or make a lovely gift. 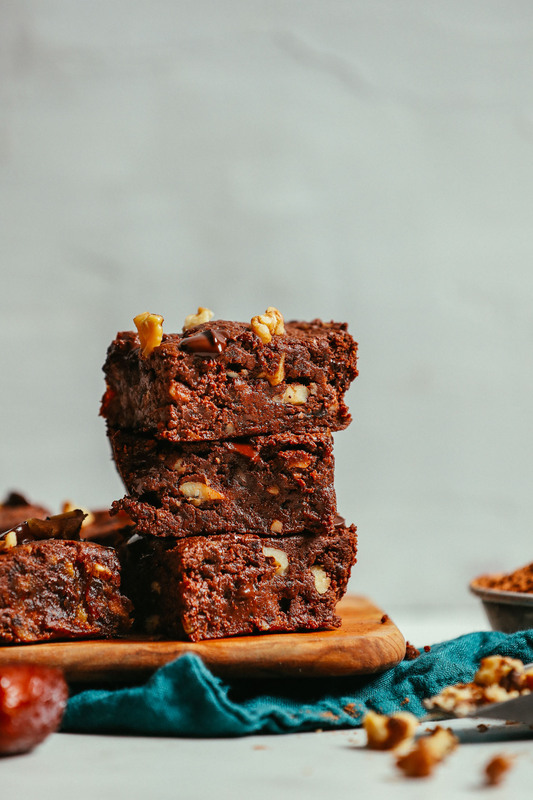 Incredibly rich, vegan, easy brownies made with just 4 ingredients and 1 bowl! Naturally sweetened, grain- and gluten-free, and so satisfying! Preheat oven to 350 degrees F (176 C) and line a standard loaf pan (or similar size pan) with parchment paper. Set aside. Once blended, separate the dates into chunks using a spoon. Then add hot water and blend until a sticky date paste forms. Scrape down sides as needed. Add peanut butter, coconut oil, and cacao powder and pulse until a sticky batter forms. It should be tacky and thick (scrape down sides as needed). Lastly add chocolate chips and walnuts (optional) and pulse to incorporate. Bake on the center rack for 15 minutes - the edges should be slightly dry. Remove from oven and let cool in the pan for 10 minutes. Then carefully lift out of the pan using the edges of the parchment paper and let cool on a plate or cooling rack for at least 20 minutes before slicing. The longer they cool, the firmer they will become. Enjoy warm or cooled. Store leftovers covered at room temperature up to 3 days, in the refrigerator up to 5-6 days, or in the freezer up to 1 month (let thaw before enjoying). *If you're peanut-free, I think almond, cashew, or even sesame butter (tahini) would work well here. *If you're oil-free, you could try subbing something like more nut or seed butter, or potentially applesauce. Simply delectable. Also the batter is delicious if you want to skip the baking! Oh my goodness! These are amazing and have now bypassed your chocolate chip cookies as my favorite dessert. Super easy and so so good. Thank you!!! I have been making these once a month or so for the past few months, and thought it was time I leave a review! First, I love brownies and dates but was skeptical AF that these would taste like anything resembling a rich, gooey, brownie. These not only met my expectation but totally blew my mind!!! They are so delicious and I cannot stop making them! I follow the recipe as written and then add walnuts, dairy free chocolate chips, and Maldon salt to the top before baking. Once they’ve cooled, I cut them into tiny squares and keep them in the freezer for “instant gratification.” In love. Thank you for this staple! PS – I also had to revert from a strict vegan to a a dairy-free, Paleo type of template. I just wanted to say that I appreciate all you do and have done and am totally onboard with this modified approach. Very excited to see how this progresses! 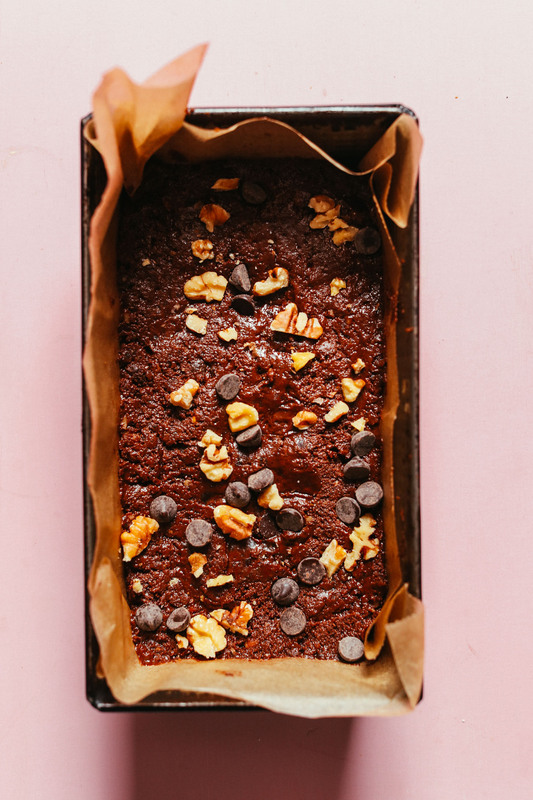 I gave up on black bean and avocado brownies after what feels like dozens of “not great” recipes – and I am so happy I gave the “healthy brownie” one more chance. These brownies are absolutely delightful! I used Tahini instead of peanut butter, but I wouldn’t recommend that unless you add almond extract or something to lessen the tahini taste. I will use almond butter next time (someone in my house hates peanut butter). I used date paste that comes in a squishy brick from the Arabic grocery store and it basically eliminates steps 1-3. I will definitely be making these again and again. Thanks! Keep up the fine work, your website is a fantastic resource. So much gold. I’m sharing it with my health concious foodie friends. Thanks so much for the lovely review, Andrew! Really appreciate it! Happy cooking! These were easy to make and tasted AMAZING. All of the NON VEGANS (EVERYONE else) loved them too. These are sooo good!! Decadent! I had roughly 1.5 cups of dates and substituted the rest with raisins. Worked out well! I also didn’t have any of the optional add ins on hand so I just did plain ole brownies. So delicious. I’m sure I will make these again and again especially when my family and I are craving brownies, like tonight… at 10pm lol… ok ok it was only me but I know the fam will love them in the morning! Next time I want to try them with the add ins for sure! I’ve been making your recipes for awhile now. Never ever been disappointed. Your recipes are the bomb dot com! Thanks! COULD i use chia seeds instead of coconut oil? and would it still taste good without the choc chips and walnuts? We think they would be a little dry without the coconut oil or a nut butter. But let us know if you give it a try! They taste good without the chocolate chips and walnuts- those are only optional for extra specialness! Wow, I made these and they remind me of a rich, dessert version of a Lara Bar. I added peanuts because that’s what I had on hand. They turned out super yummy. Next time I make them, I think I’ll add vegan marshmallows to create a rocky road version. Oh it looks very delicious! I will definitely try this. I was wondering how the brownie is made out of 4 ingredients when the recipe says 7? Hi Janne, 2 of the ingredients are optional and 1 is water (which we don’t count as an ingredient). Hope that is more clear! I made these and wow are they tasty!! I didn’t have enough dates so I filled in the gaps of my 2cup measuring cup with salted mixed nuts. I was afraid it would compromise texture but nope! I think I will bake them a smidge longer next time. Also they’re a little less sweet without the rest of the dates than you would expect from a brownie but I don’t mind that at all. The flavor is still rich and they’re superb with a cup of coffee!! We haven’t tested that but if you try it let us know how it goes! Hi Sarah, the peanut butter taste is pretty mild, but you may want to stick with almond butter just in case it’s too much for you! Hope that helps! If you give it a try, we would love to hear how it goes! Okay, let me just say – YUM! These turned out sooo chewy and delicious. I used a crunchy natural PB, which was blended with the date mix but some small peanut chunks remained. Mixed with the walnuts… Soooo good. I’m so excited to bring these to an all-vegan get together tomorrow. Thanks for the recipe! I was kind of hoping to get the measurements. This is for a presentation at school, so I would have to present the amount each ingredient needs. Your recipes never fail me. I’ve been trying to eat better but wanted to bake something. This was so so good! I added pecans in the batter and toasted coconut on top. Everyone liked it at my house and now I have a new go-to! Hi. I tapped on this link because it said “four ingredients”. There aren’t four ingredients which is misleading. Hi Veronica! There are four ingredients (not counting water) with two optional ingredients. Hope this helps! These were easy to make and very tasty. I did not soak my dates and will definitely soak them next time because I had to double the hot water to 1/2 cup to work the batter. I used almond butter and added about 1 tsp. salt. I had a small pan 10″ x 8″ and only 1″ deep which was perfect. I would suggest oiling the pan before putting in the parchment paper. I am freezing about 1/3 of the brownies to enjoy longer. Whoa!!! These are completely fabulous. They even won over my brownie snob husband and son. I’ve been looking for a GREAT vegan, naturally sweetened brownie forever! Boom. Found it. We ate the whole lot straight out of the oven, fudgy and perfect, no substitutes. My 4 year old and I were very generous with the measurements and didn’t measure accurately, still excellent. Thanks!! Whoop! We’re glad to hear that, Emily! I have hust made these with my 3 yr old and ge licked the bowl clean before they went in the oven. the test will be to see if the older two will be able to tell they arnt flour/butter and sugar. i had to blend the dates in my ninja to get them really smooth so there is a bit more water than suggested. then transferred to food processor to finish off. used half peanut butter and half almond butter, and pecans and choc chips. I tried your recipes today and I really struggled with the blender because the paste came out super sticky and my blender could not make it through. I was wondering which kind of blender do you use ? I started with my Vitamix 750 and it literally stoped and then I tried with a Cuisinart one, but same to sticky. Due to that also struggled a lot to put the paste in the pan, what could be the reason too much water ? If any one as some good suggestion, thank you in advance. At the end after all that they came out pretty good, I already ate 3 pieces (ok they are not thick as yours). Thank you for sharing your beautiful recipes. Hi Fanny! We use a Blendtec and find that it works quite well. It sounds like your blender is having a tough time.. my suggestion would be to add a bit of water and you should see improvement. Good luck! These are UNBELIEVABLE. I made these for my family and co-workers and no one could believe that they were made with all-natural ingredients. They taste just like a rich and gooey fudge brownie. SHOCKING. I will be making these on the regular! These are very tasty and feel healthy too :-) The batter had tasted very date-y, more like a protein bar than a brownie, but once they were baked with plenty of vegan chocolate chips the flavor was spot-on. I also really questioned the texture (seemed much too wet), but people liked the fudginess. The flavor of these were delicious and spot on, however mine never firmed up. Even after cooling in the fridge they were like thick pudding and had to be eaten with a spoon. Me too! Ended up rolling them into balls and freezing. Still tasty! Okay SO. I am a baker and wedding cake maker by (side-hustle) trade. I have the biggest sweet tooth and yes, I eat flour and refined sugar and eggs etc. etc. I’m essentially a vegan persons nightmare however recently due to some health issues I am trying to switch to a significantly more plant-based, gluten-free diet. I should also add that my flour, refined sugar, dairy chocolate chip brownies are a HUGE hit with anyone I’ve ever made them for, they’re pretty darn delicious, in my humble opinion :p Anyhow, back to my health issues, I haven’t been able to curb the sugar cravings all that successfully, though I do love dates and natural peanut butter. I stumbled across this recipe two days ago. Read the ingredients and thought “Hmm. Interesting.” and decided to give these brownies a shot last night but I didn’t have high hopes (sorry! I’m really new to this). I cannot believe HOW delicious these are and how simple the ingredients are. Truthfully unless someone asks for my old brownies specifically, I probably won’t make them that way anymore and will continue to stick to this recipe and perhaps experiment with it a little – not that it needs any variations, I’m just now very intrigued to continue on with this kind of baking. These were delicious! I didn’t have a loaf pan at the time, so I made them in muffin tins and ate them like little muffins. They were so tasty and rich, and I got a boost of energy from them because they’re filled with good things! I especially liked them straight from the freezer. these are delicious! I used the metric measurements and I think 400g of fresh dates was a little too much (400g made for 2 tightly packed HEAPING cups) and the result was something not quite solid enough to be considered a brownie (more like thick frosting). still, delicious. Tastes best when kept in the freezer. I think folks expecting something brownie-like might be disappointed. Not like brownies at all. This is a date fudge. Very good, but definitely not a brownie. Thank You putting this recipe out there. I have read all the comments and have concluded that the ingredients in the recipe are a good starting point, as substitutions based on one’s preferences work well too. I made these brownies to the letter and surprised how healthy and delicious they taste. Thank you for this recipe, these are SOO good! My husband doesn’t like dates so he didn’t have high hopes for these, but he loved them!!! They were easy to make and most of the ingredients are ones I always have on hand in the house. My beautiful brownie is in the oven and oh my god it smells amazing!!! :D so looking forward to trying it :))) Thanks heaps for the recipe! Hey, wich size should have the baking pan? We used a standard size loaf pan! 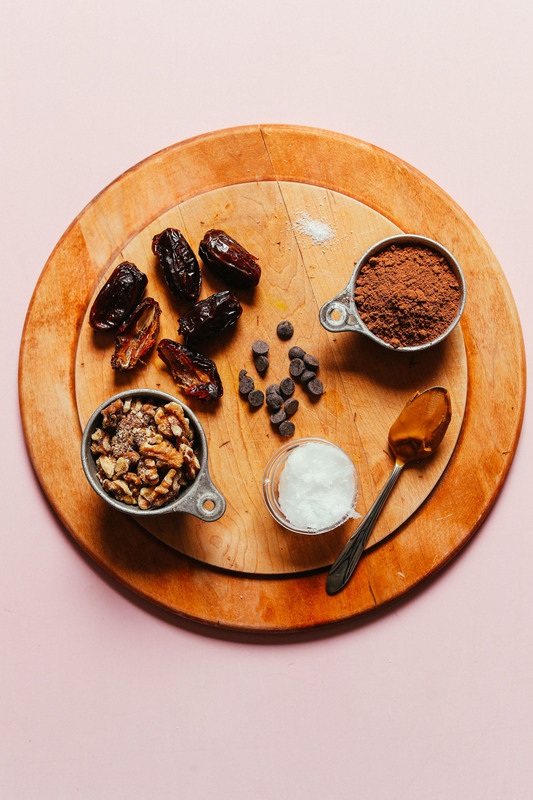 Do you think this recipe would work with cacao paste? As in a block of cacao with pieces shredded/shaved off? Looks so delicious! I’ve made these twice now and my very non vegan partner loved them. The first time I added walnuts and dark chocolate as suggested. The second time I cut back a bit on the chocolate and added some sultanas soaked in sherry with orange zest and Christmas spices, as I was craving Christmas cake but all the gluten free ones I are were so dry and awful. It was delicious! Can I put in a request… any chance of an uttapam recipe? I ate these amazing, fermented, GF crumpets in an Indian restaurant but the recipes I’ve found online call for rice grinders, which I don’t have. Also, have you ever tried cooking with sorghum? I bought some as I miss pearl barley and pearl couscous so much now I don’t eat gluten, but it tastes a little tough when I cook with it. Yum! Those are great additions, Lucy :D Thanks for the recipe request as well – I have added it to the list! I am a visitor to this site from India and was reading through the comments trying to decide whether to make it (I only have a few Medjool dates left now and can’t squander them!) and saw your comment. I have made plenty of uthapams (and I now make rice-free, millet based versions as well – using our local grains) but the ones you would have eaten would be rice based and they are the easiest to make. You don’t need a grinder, if you reduce the quantity in the recipe. You can use your normal blender/food processor. Just make sure you have a warm place to ferment it (it has to rise a bit) and when you blend, don’t blend too fine. I hope you get to make them and enjoy them! Good luck! What a helpful comment, thank you!! Do make these, they are delicious. I can’t always stretch to Madjool dates (although if I can make it across the city to an Iranian store, Iranian dates are very similar and much, much cheaper). I’ve found that if I soak dried dates for an hour in boiling water, you get a pretty good substitute. Even for date caramel they are ok! Thanks for the tip on uthapam, I’m going to have a try now! I love this recipes so tasty. I was wondering if the brownies could be heated up again and served warm? If so what would be the best way to do this? These brownies are amazing—even my four-year-old, omnivore, gluten-eating, daughter loves them. Thank you for another delicious, simple, and healthy recipe. So good!! I made this for a friend (who is vegan) and her husband (who is GF). I’m kind of a dessert purist, so I was skeptical of this whole brownies-with-no-eggs/butter/flour thing but I gave it a shot…and I’m so glad I did! I sampled a small piece and had to restrain myself from gobbling up the rest of the gift. :) I’ll be making this again ASAP! I think this recipe would be a hit with anyone, regardless of their dietary needs or preferences. I’m picky about my desserts, so I can personally attest that this is not one of those “it’s good…for a vegan/GF dessert” recipes. It’s good, period! I needed a vegan dessert for an unplanned holiday visit. These were AWESOME! I made exactly as the recipe read, and used almonds for the nuts. I did bake for about 18 minutes. They were soft, but did set. I will DEFINITELY be making these again!! Thanks for another great recipe ! Whoop! We’re so glad to hear that, Maria! This is such an awesome recipe. A hit among my friends. Thank you! Great vegan brownies! Their combo of deeply chocolatey, fudgy, crunchy, vegan, and EASY is a total winner! I followed the recipe exactly, baked two minutes longer and might go even longer to get them a slight bit more cakey. But love them as is! Whoop! We’re glad you loved them, Molly! They are great! I am making those the second time around. I bake them a little longer though so they firm up better. Hi again. I posted a review that the brownies were delicious but never dried up (or firmed up). I’m happy to report that overnight they did firm up quite a bit. They are still extra gooey and not cake like but you can cut them and use a fork. SO FANTASTIC! This recipe is added into my recipe staples! Whoop! We’re glad to hear that, Julie! The taste is delicious, however, they remind me of the half-baked brownies we would intentionally make in college. The batter did not dry out just like every other vegan brownie recipe I tried, SO, I solved the problem by getting a spoon, digging in, and falling in LOVE! The flavor is so good, rich, and well, they literally melt in your mouth. I baked with my 11-year-old son and we had a blast whipping this together and digging in (BTWs, the batter was good before it even went in the oven). We will definitely be making this again! Just don’t expect cake-like brownies. These are fantastic!! And very timely as I’m 38 weeks pregnant and trying to eat my daily dates! 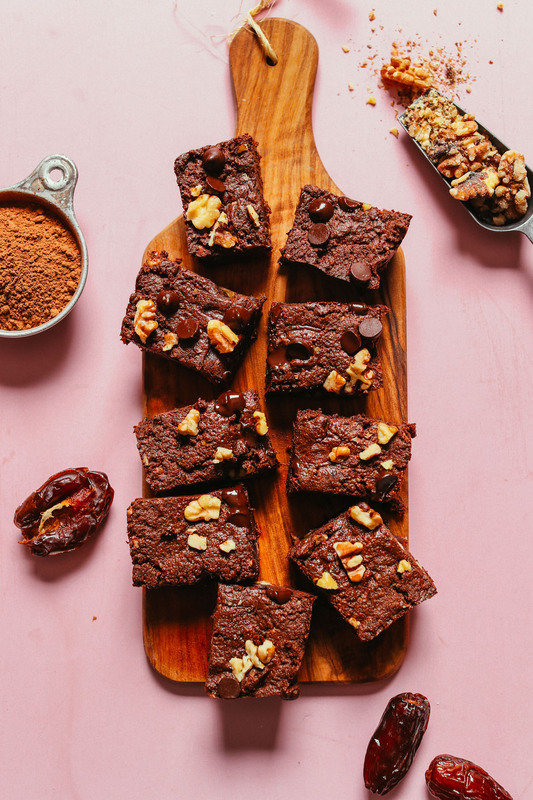 Not a huge fan of dates but love these brownies. Seriously the best thing ever! Easy to make. I have a terrible sweet tooth and this really was a great item to have on hand when I was craving something sweet. It kept great in the fridge and easy to grab on the go! Thank you for a sweet alternative! OMG, what a recipe!! I would never have imagined they would turn out so good.. Love love love these fudgy brownies and so healthy too.. Guilt free pleasure!! Thank you dear minimalist baker.. On og your many winning recipes. Unfortunately this recipe didn’t really work out for me. I found the batter to be very difficult to work with. My food processor literally stopped working because it was so thick and sticky. I transferred it to a bowl to finish mixing it by hand and mix in the chips. Also getting it spread into the parchment-lined pan was a project. Then I baked it for 40 mins and it never firmed up. I even ended up putting it in the fridge for an hour and the inside never firmed up; it was like raw batter. I think next time I will maybe add fewer dates, add some milk to thin the batter, and add some flour to help it firm up, and also maybe cook it at a higher temperature. The flavor was nice though. Very rich. So, these hold their form because of the thickness of the batter. they don’t need to “firm up” in the oven, but rather just dry out a little and get a little crusty on the edges. As far as the food processor goes, what kind do you have? Not all processors are made the same. I have a 7cup cuisinart and it works like a charm. But yes, sometimes dates can give machines trouble! Well, what I mean is, they didn’t look like the picture you show. They didn’t cut into squares, they were just mush, so I guess when I say they didn’t firm up I mean they didn’t dry out. I will try them again because the flavor was very good and my husband loved them because he likes raw brownies lol. My food processor is a cuisinart, probably about 7 cup, that I’ve had for many years and has never let me down before! :) I was thinking of maybe soaking the dates before blending? Anyway, thanks for your response. Like every recipe of yours that I have tried, this is AMAZING. I absolutely love your recipe blog, as I routinely refer clients (I’m an RDN) to you as a resource for healthy, nutrient-dense, plant-based recipes that are also very approachable and simple. I made these as described except I used a half a cup of Trader Joes Mixed Nut Butter (almonds, pecans, cashews, brazil nuts, walnuts, hazelnuts) instead of peanut butter. They are delicious! Of course! 😊 Thank you for all you do. Oh,I also cooked them 15 more minutes than indicated in the recipe. I madethis, and it worked although I’m quite unexperimented! I forgot half the dates. It worked nontheless. I put 3 third almond milk and 1 third walnut oil instead of coconut oil. It worked. Had a more pronunced peanut taste than chocolate, ill add more cocoa next Time. Ha! Thanks for sharing, Tati! These are the perfect brownies. Just a few healthyish ingredients and minimal effort. Even when I’m too lazy to measure all of the ingredients and they still turn out amazing. Thank you so much for another perfect recipe!! We’re so glad to hear that, Laura! Very tasty, but very gooey….wonder if one should add something else for a little more firmness? If you added oatmeal, it would almost taste like no bake cookies. OMG! These brownies are AMAZING! So full of chocolately flavor and simple. I used unsalted peanut butter and did not add any salt – thought they turned out beautifully! I will be taking these to my company holiday party next Friday, for sure – Thank you, Dana! I am now making the brownies for the second time!!! They are exceptionally good!! Instead of chocolate chips , I added cocoa nibs. Oh My, These Are Good. I baked them almost 25 minutes because 15 minutes just didn’t seem long enough…I was worried they wouldn’t be warm through the middle. I don’t think you can really over or under bake these to be honest. After all, there is no raw batter or eggs to worry about. Over-baking seemed to firm up around the edges a bit more. They ARE super fudgy…almost fudge-like. These are super chocolatey and flavorful! We added chopped up pecans and vegan chocolate chunks. These were EXCELLENT and we will definitely make them again. I just made these, and followed the instructions as best I could and after 20 mins they were still really gooey inside. Any tips for this issue, Longer cooking, less heat or leave for longer when taken out? I’m wondering if maybe they were too oily if you’re nut butter was really runny? Perhaps they just needed more cacao powder or some nut meal? Okay! I will try this out, I did use some maply syrup, so maybe too runny, they do however taste divine!! Hi! Looks like more than a few people posted about this gooey issue. I just made the brownies too, and mine are also really gooey even after leaving extra baking time, and extra setting time. Honestly, I think it’s the recipe. I’m leaving two stars because it’s too sweet for my taste, too gooey, and for my baking-challenged self, this was honestly difficult for me to make because the batter was so sticky. came here with an update! once the brownies had sat in the fridge for a couple of days – they became SO delicious. the flavors blended, the texture set. I ate them all. still, would love some tips on how to make them more easily – I really struggled with that sticky batter and my tiny food processor. (I do have a vitamix I could try instead next time. please advise.) thank you! I made these a few days ago and they were awesome tasting! Unfortunately, I had family with nut allergies visiting, so I made them with tahini instead of peanut butter and they never really set (like some other comments), I am thinking maybe the tahini was more oily that the peanut butter and I should have cut the coconut oil down or out? The flavor was still awesome and we just froze them and ate them cold, lol! Amazing that they don’t taste much like dates or tahini!! Yeah, that can be the case. My tahini is often much thinner than my PB. Sooooo good! Didn’t have the coconut oil for some reason, so just substituted it with tahini. Worked a treat. Another great recipe. Thank you! This is such a great recipe. I’ve had some health issues lately which has led me to search for better alternatives to still satisfy my sweet cravings. So glad I stumbled upon your site. Next time I’ll try your savoury dishes. I made this amazing brownies and perhaps next time I will just leave off the chocolate chips as the dates itself as a base is sweet enough for my liking. When you can, I hope you whip up something sweet (not a beverage) with matcha powder. Thank you Dana! You’re extremely talented. The flavor of these brownies is amazing!!! However, I baked for more like 20 minutes and they never fully set. They were so gooey inside, practically everywhere aside from direct sides. Did I miss something? I also has this issue! Hmm, they are supposed to be fudgy. Did you let them cool? I let them cool for the 30 mins but were still super sloopy! Maybe leave for longer? Mine were wonderfully tasty but alas didn’t set despite an overly long cooling time. I followed the recipe religiously so I’m not sure why this happened although my medjools were quite moist so perhaps I didn’t need the two tablespoons of apple sauce after all. But no matter. I’ll definitely try this again….and I’m still gonna eat this whole pan of sloppy-deliciousness. So unbelievably yummy. Amazing recipe! Rich chocolatey and fudgy. I didn’t have enough dates, so swapped 1 cup for 1 banana and added 2 tbsp brown sugar since my banana was a bit underripe. I also used coconut butter in place of the oil. I added in a little espresso salt I had in the pantry. Came out perfect! So good. I’m keeping them in the fridge since they are very soft and fudgy and I actually love these brownies with a bit of chill. Definitely a keeper and I can’t wait to make these again for my daughter when she comes home from college for the holidays! Wow! Sounds amazing. Thanks for sharing your changes, Jen! I tried this recipe with tahini instead of peanut butter and oh my goodness it was DELICIOUS!!! I was wondering if that would work! Thanks for sharing, Rio!! Absolutely love it!!! Easy and quick to make and super delicious!!! Defo going to my favourite recipe book! I’m curious what Cacao powder you recommend? Ashamed to say I only have the Hershey’s brand and I’m sure it’s gotta be a few years old by now! I wanted to make brownies and I had dates. I received this recipe in my email. Lucky day! they turned out perfect. I mixed the chocolate chips in the dough and put the nuts on top. I put them in the fridge for two days and now they are even better. Thanks for your recipes Minimalist Baker! As with all of your recipes that I’ve tried, these brownies turned out perfect! Chewy and fudgy. Wish I had doubled the recipe. Delicious! I used cashew butter and they turned out great. I also added a little bit of sun potion mucuna pruriens and he shou wu for an extra boost of happiness:). SO smart! Thanks for sharing! I made these yesterday and…wow! They are tasty and fudgy and super easy to make. Thanks for sharing as always!! Dana thank you so much for this wonderful recipe. I have been sugar free for almost 2 years, and I loved finding a recipe that allowed me to use dates instead of the sweeteners I usually use. I also didn’t have the chocolate chips, but these were delicious anyway! I thank you, and keep the recipes coming!!! Your recipes never fail! another fantastic treat. My partner and I were wowed! Moist, rich, gooey and fit my insatiable chocolate craving perfectly. I had everything minus choc chips and was more than satisfied with the outcome. Will def make again and share with others! Lovely! Thanks for sharing, Zofia! I made these exactly as the recipe was written and it turned out sooo yummy and soft. 10/10! This recipe is delicious, I made it earlier today. I did 1,5 cups of dates and one avocado. Made it extra creamy. I used the “Made Good” chocolate chips, they melted perfectly inside the fudgy brownies. Amazing! WHAT IS PULSE? 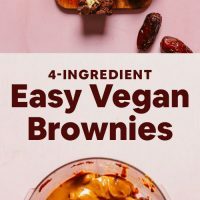 in the 4-Ingredient Vegan Easy Brownie Recipe? 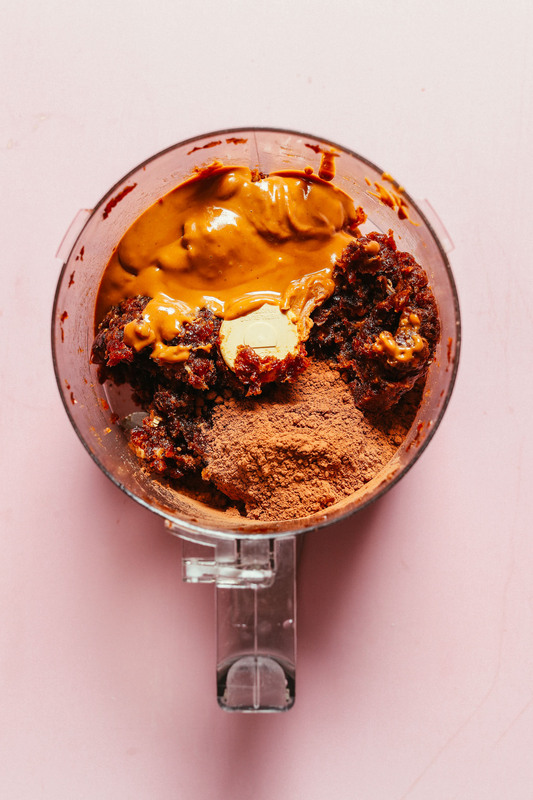 Pulse is to push the ‘pulse’ button on your food processor instead of mix, which can overmix the batter. I just made these brownies and they are so delicious, thank you. I didn’t change a thing and they were great! Love this super-healthy, super-tasty recipe! I cooked it in the air-fryer for 12 minutes and it turned out perfectly. Thank you!! Ooh, smart! Thanks for sharing! I saw this and had to try it. So glad I did. I used cacao nibs and sliced almonds. So yummy and easy! I wanted to make brownies and wanted to use up dates, so I was thinking about making raw brownies, but stumbled upon these. Genius! Fabulous! They are the real deal. So fudgy. So deeply chocolatey. Next time I may use coconut butter as another person did, but truly I don’t think 2 T of coco oil divided among 8 to 10 brownies is going to ruin anyone’s health.—that’s 1/4 of a T. Good thing I belong to Costco—they sell Medjool dates for a reasonable price and I will be making these often. 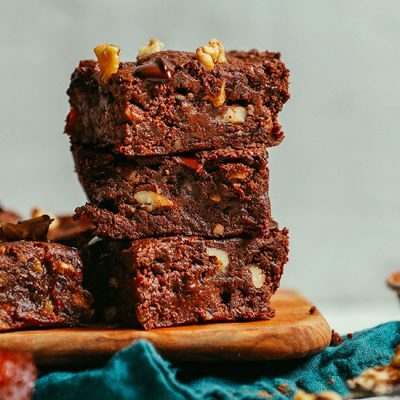 You were already voted best vegan blog BEFORE these life-changing brownies—but these would definitely have assured the number one spot! I made these last night and had to resist eating the whole pan in one sitting! After they’ve cooled, they almost have the consistency of fudge. Will definitely be making these again. These brownies are totally indulgent. So rich and satisfying. I made no changes to the recipe and it’s absolutely spot-on perfect for me! Just wondering if you think I could get away with leaving off the nut butter. My daughter is allergic to nuts but would love to share this with her. What about trying a seed butter, like tahini or sunflower butter? Just made these today! WOW! Thumbs up from all the family just a little too sweet for me but will definitely be making these again and wondered if I could add maybe a little coconut or almond flour? Just so it isn’t as sweet? Just an idea that I hope will make it not so sweet. Sure! I think that would work! Let us know if you give that a try. I think almond would be best. Is there something else I can use besides dates? I just do not like them. I think their flavor is pretty well masked. But you could try another dried fruit OR trying one of our baked brownies! WOW! Too good to be true… Yet so delicious! When I saw dates I expected a raw fruit and nut bar masquerading as a brownie but these are legitimately like the real deal. I actually haven’t had a baked brownie since going vegan and as I avoid sugar these were perfect. Also I love how you can freeze them for quick craving relief… I just added more peanut butter instead of oil (as I’m suspicious of coconut oil and how to melt it lmao also so expensive!) and it didn’t affect the taste at all. Also instead of chocolate and walnuts I just sprinkled 1/3 cup cacao nibs on top and it worked beautifully. The only hard bit is going to be not eating all of them (neat trick- eat a slab of brownies without cutting them and say you only ate one big brownie). Hi there- love making your recipes. I am also wondering if there is anything that can be substituted for dates ( besides prunes)? Could sugar be used and if so how much? I never liked dates, although I assume in this recipe one wouldnt be able to really know the sweetness is coming from the dates. LOVE this recipe!!!! Made these and they are my new, fave, brownie!!!!! I just made them, and they are great! Really delicious! What alternative could I use for dates? Prunes, maybe? It would affect the flavor, but may work. Let us know if you give it a try! I wouldn’t suggest prunes because of acidity. Figs or soaked raisins would be much better. This recipes sounds great. I have made you black bean version as well and it was good so I am looking forward making these brownies. I have one quick question. How would you suggest making a blondie version of this recipe? My son and I enjoy brownies but my hubby is not a chocolate fan so it would be nice to make something everyone will enjoy. Hmm, good question. Perhaps omitting the cacao powder? And trying to add in some other nut butter, like almond or cashew? I am oil-free and have been having good results subbing a mix of ground flax and water for oil. I’m looking forward to trying this recipe. Looks like a good one! What is the proportion for the flax egg when you substitute it for oil? Thanks! Well, I’m not exactly sure. But I think I’ll try 2 tsp flax meal + 4 tsp water. When I sub flax egg for oil, I try to have the total amt subbed equal the original amt.